Monday, January 15, 1968… it was a bright winter morning at the Maude B. Davis middle school in Costa Mesa, an Orange County town located just inland of Newport Beach. That day, the warm Santa Ana winds brought a north breeze, brilliantly clear skies, and temperatures in the 70s. A fine winter day in Southern California. I was a thirteen year old kid in eighth grade. I held a growing fascination for old surplus military airplanes (not called warbirds back then) and, in particular, the B-17. My B-17 fetish had been fed by the TV series 12 O’Clock High and I built models and devoured books about the fabled Flying Fortress. I had never seen one fly, nor did I expect to any time soon. Flying B-17s in 1968 were relegated to fire bombing and ant spraying. Well, this day sticks in my mind because I remember standing on the school’s blacktop area, probably between classes or going to lunch. I heard a low rumble off to the northeast. My unpracticed eyes scanned the horizon, broken by the imposing mountain we called Saddleback that rose above the Marine Corps Air Station at El Toro. Soon I could make out the source of the low rumble, it being a large four engine airplane heading directly toward me at an altitude that couldn’t have been more than 1,000 feet above ground level. At first I thought it was a DC-4…what else could it be? As it grew nearer, though, I recognized it as a B-17. It still flew directly toward me and my little world, and I then could make out that this B-17 was in full camouflage colors, with turrets and guns and colorful nose art. Just before it reached me it began a gradual turn towards the south, giving me an even more dramatic view of the Fortress as it thundered past. I continued to watch as it flew a downwind pattern for landing at nearby Orange County Airport, lining up for a landing on Runway 01 Left. It then disappeared from view behind some trees and buildings between me and the airport. I stood there, my mouth hanging open. I couldn’t believe it, that a beautiful B-17 had just flown by. Looking around, it was as if nobody else around me had even noticed. There may have been one or two upturned faces among my fellow students, but I didn’t see any. Well, I stood my ground patiently, but the B-17 did not return, and I eventually had to go on to class. A short while later, though, I heard it thunder over again as it flew the same pattern. It was all I could do not to jump up and run outside, but that was something a junior high school student did not do in 1968. Later that day, our afternoon newspaper (the Orange Coast Daily Pilot) included a feature story on the front page about the B-17 and its flights over the area. It seems Tallmantz Aviation was about to use the B-17 in the filming of a movie, and that it had already left for Santa Maria. 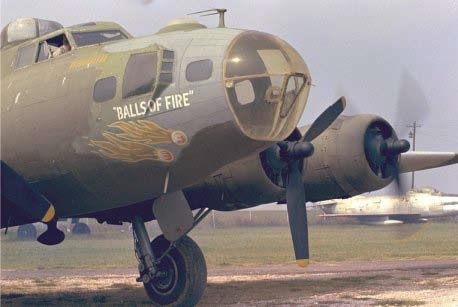 There was a big photograph of the B-17 with Frank Tallman ducking under the wing, under bold nose art Balls of Fire scribed across the nose. In the subsequent years, I would see that B-17 often at the Movieland of the Air Museum at Orange County Airport, but if it flew again, I missed it. With faded paint, it pretty much sat until 1972 when it was rejuvenated and sold to Jr. Burchinal, who flew it off to Texas. That airplane, 44-83525 (N83525) is now with the Kermit Weeks collection. Many years later, in late 1979, I was doing an interview with the general manager of Tallmantz Aviation, Frank Pine. Frank was a big man, very crusty, hard of hearing, and with the kind of wrinkles around the eyes that come from thousands of hours of airborne squinting. As gruff as he was, Frank was very helpful to me and my efforts to write a story about Tallmantz Aviation, the first I ever had published as it turned out. I probably interviewed him for six hours over the span of a week or two. At one point, I asked him about that day in 1968 when I saw the B-17 fly. He told me that he recalled the day very well, pulling one of his well-worn logbooks from a shelf behind him and thumbing through it for the date. Both he and fellow Tallmantz pilot Jim Appleby were getting FAA checkrides in the B-17. Appleby had magnificently scrambled to get the USAF-surplus B-17 pulled together at Davis-Monthan AFB during prior weeks. Appleby had flown it to Orange County on Friday where, over the weekend, a studio crew applied a paint job, added the cosmetic turrets and guns, and had it ready for the Monday morning session with the FAA. After the checkrides were over, Appleby flew the B-17 up to Santa Maria to be used in the filming of The 1000 Plane Raid. Pine followed along behind in one of the Tallmantz B-25 camera ships to be used to film some air-to-air scenes for the film. Just a small little story.